There has obviously been a lot of chatter in recent years about 4K, but is it enough? 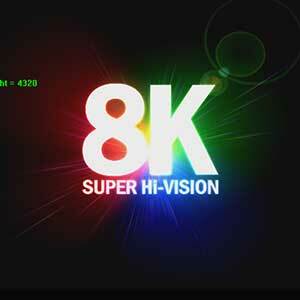 8K and beyond is where the excitement lies, but not in the way you might think. 8K and beyond for broadcast, both of which are easily achievable in a software-only, IP environment, may seem a bridge too far for most at the moment, and they're probably right¦for now. However, where 8K and beyond is relevant in my view is in the still in many ways nascent world of whichever reality you want to create, virtual or augmented. You see, 4K in a virtual world just doesn't cut it. With very little effort, you can still for the most part see the pixels in those slightly goofy headsets, which tempers the virtual or augmented experience. It's a bit like playing five-a-side football in your local park. You can pretend you're in Maracana Stadium, but the illusion is shattered as you scrape the dog mess from your cleat studs. In other words, in order to achieve a truly immersive, and inherently believable virtual experience, it has to feel real. That sounds a very simplistic way to put it, but it really is that simple. However, to achieve that is a different matter, and I would argue that the only way to approach that level of reality is at resolutions 8K and above. Fortunately, a lot of people are working on the next stages of virtual and augmented reality, and by that I mean not only what is achievable in terms of resolution and the experience, but perhaps more importantly what it means, both in terms of the potential applications and as a potential business proposition. Many in our industry, (well, OK, the broadcast industry, which Cinegy is "of" but not necessarily "in") are working on those issues, and we were asked earlier this year to a play major role in that development. The "ImmersiaTV" project is an EU consortium of university technology incubators, research institutes, and commercial entities, Cinegy is collaborating to research and develop the future of home entertainment, which includes virtual and augmented reality. What the project intends to answer are questions about how immersive technologies contribute something substantive and enduring to entertainment? How can the technology be used to tell a story or help drive a narrative? And will consumers ultimately accept and embrace the new experiences being offered? For me, you have to start with, "What's it look like?" Only then will we get an idea of whether immersive technologies can truly contribute something substantive and enduring to entertainment; how can the technology be used to tell a story or help drive a narrative; and will consumers ultimately accept and embrace the new experiences being offered. At 4K, even an untrained eye will - even if they may not immediately notice pixilation - soon get a sense of being uncommittable or "not quite right". Our role is to provide production tools and depth of experience needed to handle disparate video streams, whether omni- or unidirectional, within the production chain, as well as provide support for integration, testing, and evaluation of what will eventually be ImmersiaTV's recommendations for end-to-end production and delivery infrastructures that can deliver the best and most acceptable VR/AR experience. 4K is already well-established as the new consumer format and that's great, but when it comes to VR, it's a different story. As I've already implied, VR is bearable at 4K, but not overwhelmingly convincing. That's because when you map, for example, an entire 360 degree panorama in 4K, there are suddenly precious few pixels to, literally, go around. The experience is "OK", which can be roughly translated in many languages as "meh", and "meh" isn't ultimately going to cut it in a virtual, augmented, or any other world. However, in the same scenario, everything comes to life in 8K. At 8K you have enough pixels to easily map an entire 360 degree panorama to breathtaking effect and still have headroom. So for anyone who wants to provide a truly immersive experience, whether in VR or television, 8K is not at all far-fetched. And that's something that broadcasters don't quite get yet. However, I grant you that at the moment I have no idea where I'd stream 8K-produced content. That said, if you're committed to VR, and want to do it properly, it will eventually need to be in 8K, so why not start experimenting with it now? It's already easy enough for us to do, why shouldn't it be for you? If you are in a VR scenario and want to zoom in on something, you need more damn pixels, but a lot of people still don't understand that. I always tell them, "Look at Google Maps' street view. Do you think the resolution is great? No? Maybe? If not, why not?" It was, after all, shot with the best technology available at the time. But what you're missing in relation to VR is that it can now be done with technology that is 16 times better. If you're going to do VR properly, you've got to get closer, you've got to have different angles, and all of that means you need as many pixels as you can get. So, the need for resolution is always going to rise, and there are a massive number of potential applications, some we have thought of, others that for now remain an illusion, but discovering and developing what those are is a large part what the ImmesiaTV project is all about. The results of the project are some way off, but in 8K and above, at least they will look real at any distance.